What does “value” mean in the context of behavioral health? U.S. health care is in the midst of a transition from fee-for-service payment to a “value-based” model. Under the fee-for-service model, providers are paid for services rendered and there is little or no incentive to coordinate care with other providers. This is a great concern in behavioral health, where many patients experience co-occurring disorders, such as bipolar disorder and diabetes, or depression and alcoholism. This patient population carries higher health costs and lower life expectancy, and has significant potential for benefiting under value-based care. This white paper addresses the transition to a value-based model — including the emphasis payers place on whole person approaches that seek to treat the entire patient. This has created a need for providers to track and report a wide range of data, including medication and appointment adherence, employment, family history, and smoking status. The emphasis on whole person treatment also requires coordinated care among different providers. Unfortunately, U.S. health care has long had a so-called “silo mentality” that does not incentivize different organizations and specialties for working together and sharing data. This lack of connectedness, sometimes within an organization, reduces effective communication, increases costs and even threatens patient outcomes. 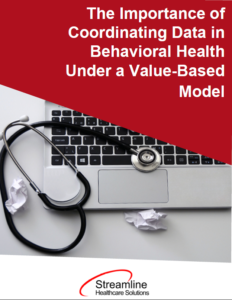 Containing data from sources such as The American Psychiatric Association Report and The American Journal of Accountable Care, this resource outlines the implications of a transition to a value-based model within behavioral health, the need for whole person treatment, the importance of demonstrating value and coordination of care, and the role of software solutions like Streamline’s SmartCare system. Streamline delivers web-based software for healthcare organizations to provide and coordinate specialized behavioral service delivery processes. Streamline’s SmartCare™ solution was developed to truly integrate all departments; moving them to a more holistic service model. Streamline’s software solutions are well suited for organizations who wish to have a system that can incorporate its entire business processes into a single solution, with the ability to continue to grow as business-lines needs evolve. Streamline has been offering software in the behavioral health marketplace since 2003. This white paper has been provided to OPEN MINDS readers free of charge by Streamline Healthcare Solutions. Are you looking for a new EHR? Who is your current EHR vendor? What challenges do you face with your current software? Will Changes In Stark Law Speed Up Value-Based Reimbursement?